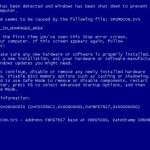 Below is a compilation of possible causes and their respective solutions to the blue screen error. You may want to consider trying these solutions if you have seen a similar error. However, we make no guarantee that any of the fixes listed below will work for you. Continue at your own risk. Yes, it’s always the drivers to be blamed when anything similar to a blue screen occurs. You may think that yours are well updated, but it’s also important to make sure they are not corrupted or in any way messed up by any malicious software you’ve previously installed. Depending on what kind of sys file the error shows you, whether it’s a graphic issue such as atikmdag.sys and nvlddmkm.sys, or a network card issue such as tcpip.sys, you will have to repair or update the drivers accordingly. Even if the .sys file is not related to any hardware that you know of, it’s still recommended to make sure all your drivers are good intact and are updated accordingly. Just in case if you have no idea where to begin. Go to support.amd.com if you have an ATI graphic card, or nvidia.com for a Nvidia video card. As for network and sound adapter, you will have to look for the driver CD that comes with your hardware. It’s best to search for their drivers online to get the latest version of the drivers. Just do a Google search by their brands and models. If the blue screen happened right after you’ve installed a new video driver, you may want to try to rollback the graphic driver to its previous state and see if it fixes the problem. Read: How to Correctly Rollback Graphics Driver. Windows registry is the core repository of your entire Windows system. It is a single place for keeping core information such as hardware configurations, system options data, computer memory settings, applications and programs settings, Windows startup configurations, etc. Well, registry is also one of the very first things people would check if a blue screen occurs. A well maintained computer has its Windows registry scanned and fixed gradually. Surprisingly, Windows 8 or 7 doesn’t have any built-in mechanism to scan or to fix these corrupted registry errors. You will need to use a Registry Cleaner to clean up your registry problems. 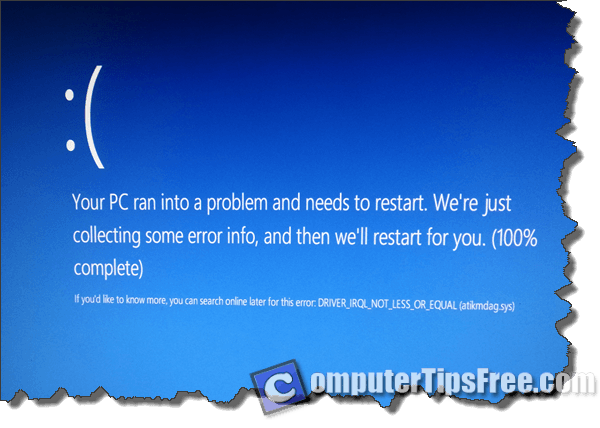 If you are suspecting that something you’ve previously installed is causing the DRIVER_IRQL_NOT_LESS_OR_EQUAL blue screen error and that you are unable to undo the harm, you can consider recover Windows into an earlier copy by using Windows Recovery. Windows gradually save copies of its image from time to time. Its purpose is to provide an ultimate way of solving something that can no longer be undone. When you recover to an earlier copy, it will be like time travel your system back to a certain date in the past. 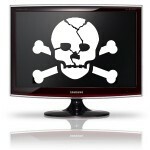 To recover your Windows, it’s best to do it while you are in Safe Mode. Boot your PC into safe mode by pressing F8 while you’re booting your PC. Select safe mode. In the Windows, press Start, and search for Windows Recovery. Follow the on-screen instructions to recover your Windows to an earlier copy. Another better way to access System recovery is via “Repair your Computer” option. While booting your PC, press F8 until you see a list of booting options. If there’s any option called “Repair your computer”, click on it. You will then be lead to System Recovery Window right away. If this problem persists running in a restart loop, where you can’t even get into the Windows, sorry but this can be a very bad news for you. Your computer most probably has a defected hardware, and that you cannot do anything else other than sending it for repair. If you know well about your computer’s hardware and you have a spare one with you, you can cross-changing your hardware piece by piece, starting from RAM, graphic card, to any PCI adapter such as your network card and sound card. By troubleshooting the issue this way you can identify the broken piece and replace it without paying for an inspection fee. Please only do this at your own risk. Well, there may be also a slight chance that some of your Windows core files are corrupted and that it needs to be reinstalled. If you have no idea about reinstalling a Windows in your computer, it’s best to consult an expert or send your computer for a repair otherwise. Backup everything you cannot afford to lose before trying anything.